I’m building a new upper and want to put in a decent 16" barrel, 1 in 7 twist. It will be free floated and have a flash suppressor on it. The receiver will be a flat top style with no irons. I will have a scope permanently mounted on it and may use it for coyote hunting. I have a Bushmaster DCM, and a Dissipator with a CMMG barrel on it that seems to collect copper fouling pretty good. 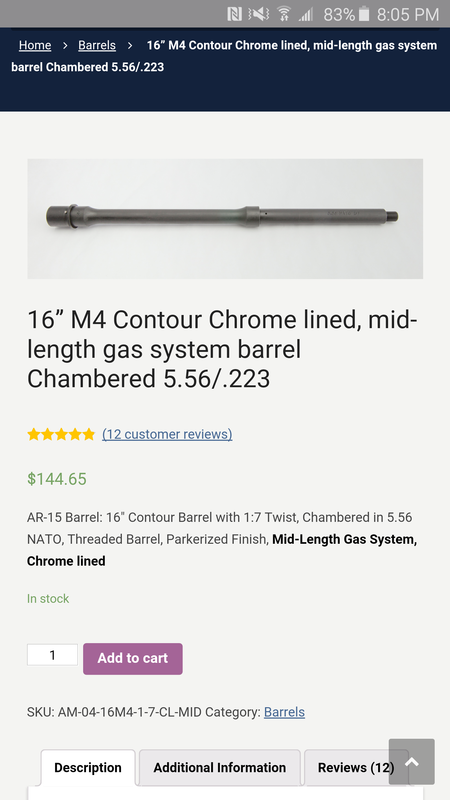 I don’t have a good feel for what is considered a good barrel for the money, I really don’t want to spend more than $400 for the barrel. I’ve switched to BHW polygonal barrels for everything. I use this place in kalispel, MT. Excellent company. Had good luck with barrels from blw, JP Enterprises, centurion, Hyperion, wilson and green mountain. All these barrels seem to consistently better in accuracy and through a bore scope. I just bought a 16" heavy barrel that’s 223 wylde from S I Arsenal that looks like it should do really well. I’ll update once I get it put in the rifle. Oh I paid 140$ and its stainless. Anyone have any experience with BCA barrels? I would look at Melonite/Nitride barrels before chrome lining. The Nitride lasts much longer! As Travis said below, look into QPQ/Nitride barrels rather than chrome lining. They last longer and you do not have to worry about the chrome lining affecting accuracy. I would suggest Faxon Barrels. They are great for the price. Plus one on the Faxon Barrels. After doing a LOT of research, I recently purchased a 16" M4-style 1450 Melonite/Nitride/QPQ 1:7 twist mid-length barrel chambered in .223 Wylde from Palmetto State Armory (part number 7791528 - I paid $120, but I see they’re temporarily out of stock as I write this). I decided on this one because I didn’t want the thin/pencil profile, the Melonite/Nitride is said to be extremely durable and .223 Wylde is supposed to be very accurate, especially with heavier 5.56 grains. And $120 was a bargain. It’s still early, but I have zero complaints so far. My vote is larue. They are on sale now for just over $200sh.